I presume the postcard presents the place in days of past glory. Never knew anyone who actually stayed at one of the wigwam places. The guy who did these applied for, and received, a design patent for the things (98,617). Ah, Grasshopper reader, the "postcard" is a collage of photos I took on Friday night. 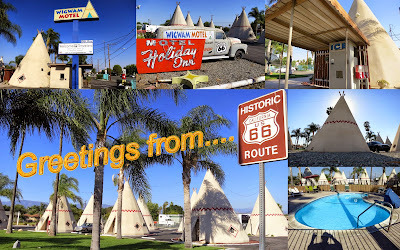 I always wanted to sleep in a Wigwam but had struck out in multiple visits the iconic location in Holbrook--fortunately the sister location on the border of San Bernadino and Rialto is still up and running. The owners are doing a good job keeping the place up--hopefully they'll keep the spirit of the Mother Road going for years to come. An excellent collage, sir! Were postcards an actual, viable industry in these modern times, you'd surely have been its Picasso! Good luck on getting that night in the Wigwam - perhaps a future posting will present a collage of views from the inside.